Joe Clark represents the next generation of professional airmen. Having a life-long dream of flight, Joe began flying during his junior year in high school. Shortly thereafter, he attained his private pilot certificate. The pursuit of his ratings led to the Walker County Airport in Jasper, Alabama, and right into the Shoreline Aviation Services company hangar. 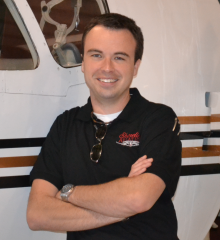 Today, Joe holds a Bachelor's Degree in Aviation from a major public university and a Commercial Pilot's License for single and multi engine land airplanes with instrument privileges. He strives to share his love of aviation with others, and his passion for flight shines brightly in the way he serves his clients. Joe joined the Shoreline team in early 2010 after his passion for aviation and potential as a young professional aviator were realized by Shoreline's founding members, who also all contributed to his training as a professional pilot. In 2012, he was appointed Chief Information Officer. He serves dutifully in all facets of Shoreline's operation with the same dedication and exuberance that led to his recruitment to the company.